HMNZS Wellington was formally handed over in October 1982 and commissioned into RNZN as HMNZS Wellington on 1 October 1982 at Portsmouth.Wellington’s first major deployment was to Fiji in 1987 during the first coup in May, She stood by in Fijian waters with Canterbury to evacuate New Zealanders as part of Operation WELLS. Leander-class frigates were developed from the Rothesay and Whitby class frigates of which HMNZS Otago & Taranaki are the examples in RNZN service. In 1981 the RNZN announced it was purchasing two Leander-class frigates to replace HMNZS Otago and Taranaki. The ships selected were HMS Dido & Bacchante. HMS Bacchante had been commissioned into the Royal Navy in 1969. She was due to be handed over in July 1982 but was kept in a support role during the Falklands War. She was formally handed over in October 1982 and commissioned into RNZN as HMNZS Wellington on 1 October 1982 at Portsmouth. She left Britain on 11 October 1982 and arrived in Auckland on 2 December 1982 via Panama and Pearl Harbour. She was paid off and began a modernisation refit at HMNZS Philomel in January 1983. Due to delays during the refit she did not begin sea trials until July 1986. She was rededicated on 21 August 1986 and first visited Wellington on 18 September 1986. There was a high standard of accommodation aboard and wool carpeting being fitted in many parts of the ship. A frigate of this nature was expected to be a self-supporting floating community, able to operate, repair and maintain its complex technology for long periods at sea. This was critical given its role as a ASW frigate. She carried out Exercises FAST FORWARD I & II and PUBLIC REVIEW in March 1987 off Auckland and Gisborne. In April she went to Sydney in company with HMNZS Southland for the ANZAC Day ceremonies then exercised with RAN vessels. Wellington’s first major deployment was to Fiji in 1987 during the first coup in May, She stood by in Fijian waters with Canterbury to evacuate New Zealanders as part of Operation WELLS. She also undertook some exercises off the Tokelau Islands and returned to Auckland in June 1987. She returned to Sydney in October and undertook further exercises with the RAN and conducted a work-up that was evaluated in Sydney before she returned to Auckland in December 1987. In early 1988 she went to the Campbell Islands to offload personnel and supplies for the DOC station there. In March, she was conducting a live shoot in the firing range east of Kawau Island when the first three shells straddled a wooden-hulled fishing boat Aranui that had not been picked up on pre-shoot radar and visual checks. Fortunately there was no damage. The next month she participated in Operation JOINT VENTURE 88 with RNZAF and Army personnel and the Skyhawks as part of a maritime air strike exercise. In June 1988, Wellington was sent on her first SE Asia deployment under the defence relationships that New Zealand was part of. While on the passage to deployment, she took part in Exercise SELINDO with RAN units in June followed by Exercise STARFISH in July. In August 1988 she took part in Exercise TASMANEX and the next month she voyaged to Sydney to participate in the Australian Bi-Centennial Naval Salute and Review held on 4 October 1988. After participation in Operation BOOMERANG she returned to New Zealand and exercised with units of the Royal Netherlands Navy. In May 1989 Wellington was sent on another SE Asian deployment and took part in Exercise STARFISH 89 and visited many ports before returning to Auckland in August 1989. In the latter part of 1989 Wellington undertook a Pacific cruise. On 1 February 1990, Wellington embarked HM Prince Edward for a regatta then when to Waitangi for the 150th celebrations. Immediately after this she was sent to Western Samoa and the Tokelau Islands to provide relief after Cyclone Ofa. In May she once again went to Singapore for another SE Asian deployment and took part in STARFISH 1990. In July 1990 Wellington embarked the PNG government delegation for the Bougainville peace talks as part of Operation BIG TALK. During the negotiations she provided accommodation for the government officials who met with the Bougainville delegation aboard HMNZS Endeavour. She returned to Auckland in August after the talks were completed. In April 1991 she undertook another deployment to SE Asia and again took part in Exercise STARFISH 91. Returning via Australia, she undertook exercises with the RAN. In October 1991, when the RNZN celebrated 50 years since the granting of the title, Wellington visited in company to Wellington for the change in Queen’s Colours. She then returned with the fleet to take part in the International Naval Review 5-7 October in Auckland. 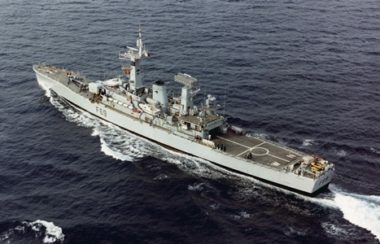 In 1991 the frigate was taken in for refit to enable it to serve beyond 2000. It was fitted with the NAUTIS-F computer based command and control system, LWO-8 long range radar, Link 11 data system, a track management system, a Vulcan-Phalanx close-in weapons system, integrated radio communications, enlarged hangar and flight deck, IFF Mk XII and a LAN. All this equipment was to bring her into line with HMNZS Canterbury to allow for rapid information handling required for multinational naval operations. The refit was completed by April 1993 when she began sea trials. In August 1993 she deployed to Singapore and went in company with RAN vessels, taking part in STARFISH 93. After returning to Auckland in November 1993, she spent the next few months in local deployment. She was the guardship for the 1994 Waitangi celebrations and in March was the guardship for the Whitbread Race Start in Auckland. Later that year she deployed for STRAFISH 1994 and visited Indonesia. In 1994 made history by being the first full operation major surface combatant in the RNZN to have females serving aboard. In 1995 she spent the first half of the year was spent in Auckland and then in July she went to Sydney for exercises with the RAN. She was present in Melbourne for the launch of the ANZAC-class frigate HMNZS Te Kaha. She then went to Singapore for STARFISH 95. In October 1995 Wellington was deployed to the North Arabian Gulf as part of the UN Maritime Interception Force. She remained with the force until returning to Auckland in February 1996. 1997 and 1998 was spent in operations in New Zealand and Australian waters. In October she visited Guam, South Korea, Japan and the Philippines before returning to Auckland in November 1998. Her last overseas deployment was to Western Samoa for the independence celebrations in May 1999. She returned to Auckland via Niue and Raoul Island. Arriving in Wellington on 22 September 1999, the decommissioning visit and charter parade were held. Returning to Auckland, HMNZS Wellington was decommissioned from the RNZN on 5 May 2000. The new badge was going to be designed for the frigate but the Admiralty agreed that Wellington would carry the badge and battle honours from HMS Wellington, a Grimsby-class sloop that served in New Zealand from 1935 to 1939. The badge had a gold crown and white field. This was changed to a silver crown and red background taken from the coat-of-arms for Wellington City. The badge was drawn by the official artist of the RNZAT and formally approved by the CNS on 3 March 1983. Note the current Offshore Patrol Vessel HMNZS Wellington does not carry the battle honours.